In this tutorial you will learn in a few simple steps how to create a world that looks like it came from the mind of Tim Burton himself. The tutorial is very simple and doesn’t require much technical knowledge of Adobe Photoshop, but rather, teaches you how to use your imagination to create an atmospheric piece of art. For starters it’s very important to have a good idea. The great thing about the Burton’s world style is that any idea, no matter how basic or complicated it is, can easily be transformed into an image if the creative method is learned well. Atmosphere is everything! The atmosphere of these images can be described as “tragicomic goth”, tragic because of a certain dose of morbidness that it has, and comic because of the fact that, even though they are on the edge of being disturbing, these pictures are quite harmless and almost cartoonish in their nature. In eternal half-obscurity, Burton’s World typically contains such elements as: gradient skies, moon, sun, clouds, stars, mist, half-transparent illumination, a casually distorted gothic style, 2D silhouettes and, of course, as many details as you can think of . The general rule is: the more details- the better. Because of the purposely distorted nature of the images, you will seldom use normal dimensions for your work. On the contrary, the more unorthodox image dimension the better. That’s why the resolution I choose is 1280×200. 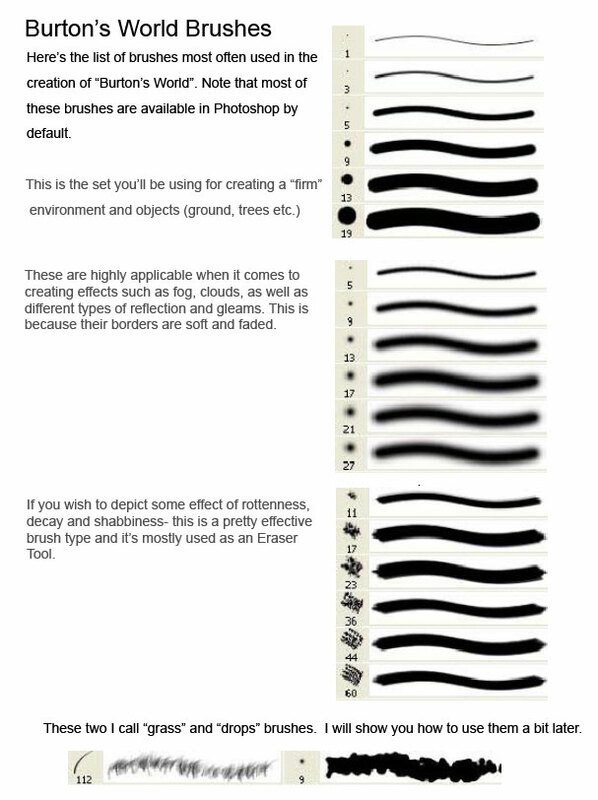 You can see the brushes used in this tutorial here. The first thing we create in our Burton’s world is the sky. Make a new Photoshop layer and simply call it “sky”. Then go to Layer Style>Gradient Overlay. And while working with gradients is fairly simple, the crucial thing to remember that the sky gradient is one of the most important parts of the picture because it sets the mood and atmosphere of your scene (with the quality and intensity of it’s colors), so choose your colors carefully. As far as this tutorial is concerned, we chose a midnight scene with a full moon, so a blue-white gradient seemed most fitting. As mentioned before- the landscape consists only of silhouettes and is entirely 2D. This layer (which you can name “the ground”), should be placed, for now, right above the sky layer. Pick some thick brush with sharp edges and start creating your world. One of the possible results might look something like the image above. It is always nice to add some sort of Outer Glow (Layer Style> Outer Glow) and a gradient (from top towards the bottom, from white towards pale gray, for example). Now let’s give the moon some craters. For that you will need a new layer (unpredictably named “craters”) and a “drops” brush to use on it. The color you’re using should be some pale gray. Stars: Paint the sky using white dots of different sizes and apply the Outer Glow effect. Comet: I added a comet as a small detail. The comet’s tail is drawn using a white brush with jagged edges and the comet head’s flash is easy achievable using the Polygonal Lasso Tool (PLT), which you will, (along with regular Lasso Too) use quite often. The Fog: Create “The Fog” layer, set its opacity to 40%, use brushes of different sizes (white color in this case) to draw the fog, and finally, place it below “The Ground” layer. Use “the grass” brush draw the grass which should, more or less, follow the contours of the landscape. 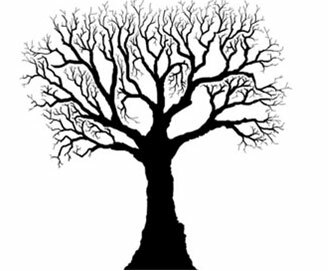 When drawing trees think fractals. It’s a quite simple principle, but it requires patience and gradualism. First, pick the 8px brush and create the root and trunk. After that you need to gradually branch it out using smaller and smaller brushes and thus creating deck with branches set as densely as you want. Use sharp-edged brushes for optimum precision.